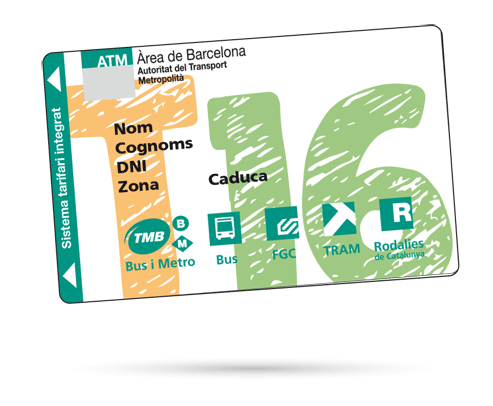 The T-16 card is a travel card for minors (children and youths) between ages 4 and 16, which expires on 31 December of the same year that they turn 16 years of age. This card affords the holder an unlimited number of journeys free of charge in the integrated fare system of the public transport network, within the same fare zone in which the child or youth lives. The T-16 card is a personalised travel card bearing the name and National ID number/ Foreigner ID number /Passport number / Family Book of Marriages, Births and Deaths. 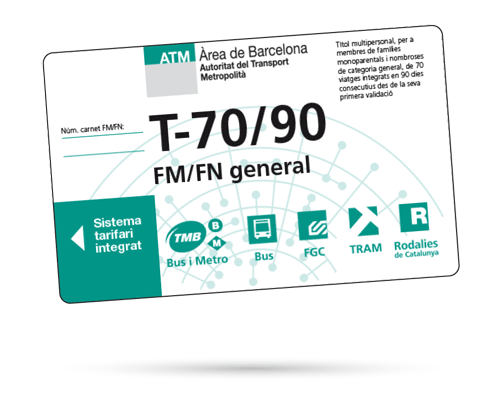 Like other cards, this card must be inserted into the card validation slot upon each journey and can only be used by the registered cardholding minor. This card is available for children and youths between ages 4 and 16 residing in any of the municipalities that form part of the integrated fare system, and may be used until 31 December of the year in which the youth turns 16 years of age. The T-16 card has an initial processing fee of €35, which the user must pay upon its initial issuance. After that, the card is automatically renewed free of charge until 31 December of the year in which the youth turns 16. Personal, non-transferable ticket for members of single parent and large families of a general category, for an unlimited number of integrated journeys on 30 consecutive days in the zones limited by the zone where the ticket is first stamped, on all modes of transport, depending on the zones passed through (maximum charge 6 zones). The ticket must be accompanied by official means of identification (identity card, residence card, passport) and the single parent or large family card. Personal, non-transferable ticket for members of single parent and large families of a special category, for an unlimited number of integrated journeys on 30 consecutive days in the zones limited by the zone where the ticket is first stamped, on all modes of transport, depending on the zones passed through (maximum charge 6 zones). The ticket must be accompanied by official means of identification (identity card, residence card, passport) and the single parent or large family card. Personal, non-transferable ticket for members of single parent and large families of a general category, for an unlimited number of integrated journeys on 90 consecutive days in the zones limited by the zone where the ticket is first stamped, on all modes of transport, depending on the zones passed through (maximum charge 6 zones). The ticket must be accompanied by official means of identification (identity card, residence card, passport) and the single parent or large family card. Personal, non-transferable ticket for members of single parent and large families of a special category, for an unlimited number of integrated journeys on 90 consecutive days in the zones limited by the zone where the ticket is first stamped, on all modes of transport, depending on the zones passed through (maximum charge 6 zones). The ticket must be accompanied by official means of identification (identity card, residence card, passport) and the single parent or large family card. Personal, non-transferable ticket for members of single parent and large families of a general category aged under 25 years of age, for an unlimited number of integrated journeys on 90 consecutive days in the zones limited by the zone where the ticket is first stamped, on all modes of transport, depending on the zones passed through (maximum charge 6 zones). The ticket must be accompanied by official means of identification (identity card, residence card, passport) and the single parent or large family card. Personal, non-transferable ticket for members of single parent and large families of a special category aged under 25 years of age, for an unlimited number of integrated journeys on 90 consecutive days in the zones limited by the zone where the ticket is first stamped, on all modes of transport, depending on the zones passed through (maximum charge 6 zones). The ticket must be accompanied by official means of identification (identity card, residence card, passport) and the single parent or large family card. Multi-person, timed ticket for members of single parent and large families of a general category, for 70 integrated journeys on 90 consecutive days as from the day the ticket is first stamped, on all modes of transport, depending on the zones passed through (maximum charge 6 zones). The ticket must be accompanied by the single parent or large family card. With timed tickets, the maximum time allowed to make a journey is 1 hours and 15 minutes for tickets covering 1 zone. This increases by 15 minutes for each additional zone. Multi-person, timed ticket for members of single parent and large families of a special category, for 70 integrated journeys on 90 consecutive days as from the day the ticket is first stamped, on all modes of transport, depending on the zones passed through (maximum charge 6 zones). The ticket must be accompanied by the single parent or large family card. Receive unemployment benefits of less than the minimum wage (MW) and make an application to the State Employment Service (Servicio Público de Empleo Estatal - SEPE). Receive benefits of less than the MW or not receive any benefits in spite of being registered as a jobseeker for at least 12 months during the last 2 years, be actively looking for work and make an application to the Labour Department of the Catalan Employment Service (Servei d'Ocupació de Catalunya - SOC). 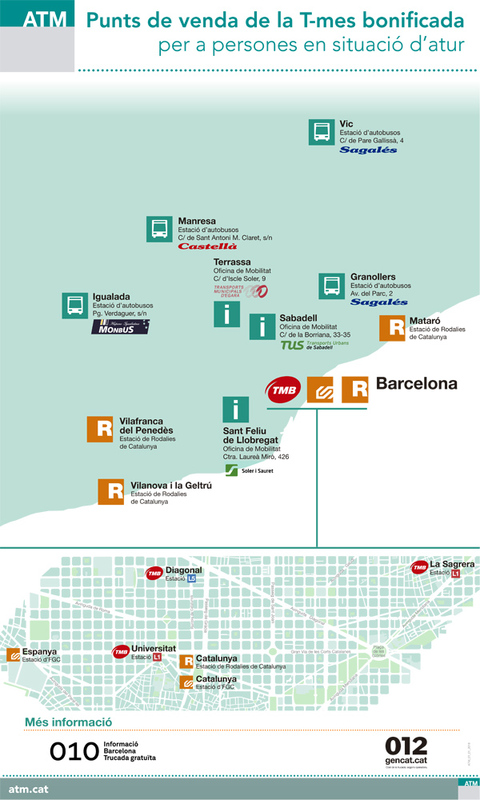 Receive benefits from the social services of the local Council of a town integrated in the ATM zone of the Greater Barcelona Area that are less than the MW, not receive any benefits from the State and make an application to the Local Council. Any person interested in purchasing a subsidised travel card must first apply for the certificate attesting that they meet one of the above requirements. Request the document certifying the period of validity and the monthly amount of the benefits being received on the application date by going to the State Employment Service website at sepe.es (‹‹Personas›› > ‹‹Prestaciones›› > ‹‹Impresos››). This document enables the purchase of a subsidised T-mes travel card for 1 zone. 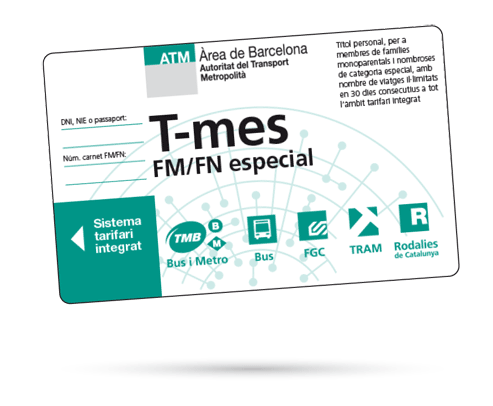 The document from the Catalan Employment Service (SOC) enables you to purchase a subsidised T-mes travel card for the number of zones described on the certificate (1 to 6 zones). 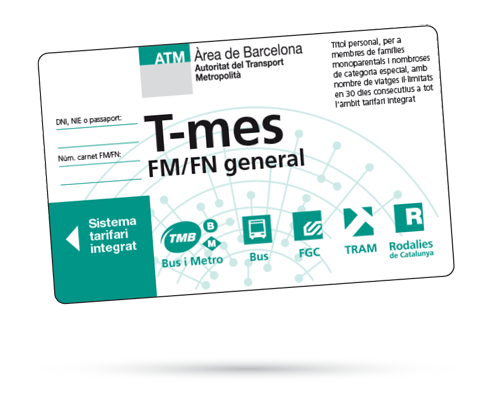 The document from the social services department enables the purchase of a subsidised T-mes travel card for 1 zone. 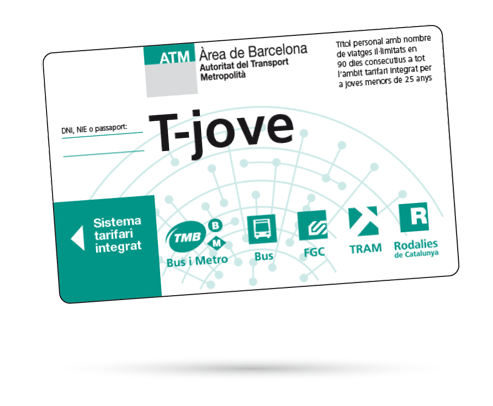 Any person wishing to purchase a subsidised T-mes travel card must go to an authorized point of sale and present the original certificate issued by the State Employment Service, Catalan Employment Service, or the local social services department together with a valid National Identity Card/Foreigner Identification Number. The certificate must be original (not a photocopy). The certificate is valid for 105 days as of its date of issue and during this time the beneficiary may purchase a maximum of 3 travel cards without any need to present a new certificate. The MW for 2019 is 900.00 €. A total of 27 days must elapse between the purchase of one subsidized T-mes travel card and another, even in the event of loss or theft.